ONE of our best-selling DATAFILES of recent years, the original print run of DORNIER FLYING BOATS sold out very quickly. 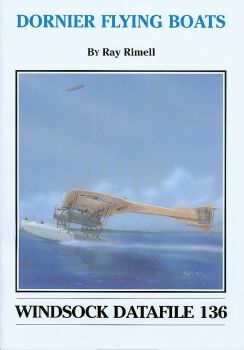 Now we are making it available once again for a limited period by producing this short-run special reprint.With 32 pages,eight pages of drawings in 1:144 and 1: 72 scale,70 rare photos-many previously unpublished- and several contemporary drawings this is the most comprehensive documentation yet published on these aquatic R Planes! Describes the Rs.I,Rs.II,Rs.III, and Rs.IV,with photos and plans of each. Plus colour data,profiles,end notes and appendices.